A month ago, when the Greek parliament was heading to elect a new president, Prime Minister Antonis Samaras was confident that he would seize the election with a little help from the left and the right. After all, in his last national televised message he went so far as to promise ministerial seats to those who would vote for Mr Stavros Dimas to become president. In Greece, it is the parliament that elects the president, and this demands the vote of three-fifths of the body in the third election. The opposition, joined by independent MPs, declared that they weren’t going to vote for Mr Dimas, causing immediate general elections. According to the Greek constitution, a plain majority of the new parliament with fresh orders from the people elects the president. 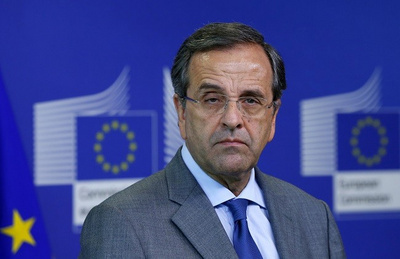 For three weeks, Mr Samaras put extreme pressure on MPs on both ends of the political spectrum. He used indirect promises and threats, saying that the country would be doomed if a new president wasn’t elected and the country would be led to a general election. In the end everything failed, and on December 29 the parliament hadn’t come up with a new president. Therefore, the country is heading for general elections in less than a month, on January 25, 2015. The economic situation in Greece is far from good, and little has changed over the last year. Unemployment remains around 30 percent and the number of homeless and desperate individuals keeps rising. New cuts, taxes and layoffs have been announced to the people, who can hardly afford to pay the taxes that have already been implemented. The opposition - led by the left alliance SYRIZA and Mr Alexis Tsipras - is talking about a humanitarian crisis, saying that something needs to be done soon. At the same time, Mr Tsipras has prioritized talks with the troika for new necessary cuts to constantly piling debt, a debt impossible to be repaid as it is. It is hard to see how they will succeed on both fronts, increase social spending and having the support of the troika, but at least they transmit hope to the hopeless. And this is what the Greek people need at this moment if they want to stand up again. Yet, it is not only the Greek people. Despite all reassurances from the European Commission and German Chancellor Angel Merkel, minimizing the deficit is not the cure. Even Germany shows minimal growth, and the predictions for 2015 are disappointing. Countries like Finland, a past champion of growth and careful economics, are in a deep recession, with forecasts showing zero growth for 2015. At the same time, unemployment is increasing in Europe, especially among young people. The need for hope is a pan-European feeling and signs of it have already started showing in Spain, Belgium, France and Italy, where huge demonstrations demand an end to the cuts and the pressure on the lower classes. So perhaps while the break of the euro-zone nearly started in Greece four years ago, now a wind of hope will start from the very same place. The recession and austerity measures have awakened a nightmare in Europe, a nightmare of a past that Europeans have tried hard to leave behind, the ghost of fascism. Under the veil of euro-skepticism, new parties, fascist, Nazi, xenophobic, racist and prejudiced, have appeared in all European states, some of them having already earned considerable power. In France, Marianne Le Pen is aiming for the presidency with serious hopes; in Finland, the True Finns are the third party; and in Greece, the Nazi Golden Down hopes for double digits in the coming elections. This is a nightmarish picture for a union that champions democracy and human rights. Actually, this is partly where Mr Samaras’ defeat lays in Greece. In his three years of governing, he has shown arrogance, self-centrism, provocative opportunism and signs of authoritarianism. And these are what the Greek people despise, making his government the third most-hated government in the world according to its citizens. In the evening, after Mr Samaras announced his defeat and the plan to move toward snap general elections, social media in Greece went berserk, with one of the best reactions saying: “best news of 2014 two days before its end. Samaras is out.” But this is a thing yet to be seen. There is a full month of campaigning for all sides in Greece, and while Mr Tsipras tries to inspire hope, Mr Samaras invests in fear.